Some of you that know my wife, Tammy, aren’t surprised at a headline like that, and honestly, neither would I, except for how fast things escalated. 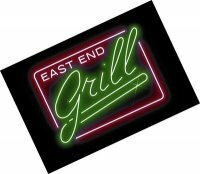 We stopped by our usual Friday night watering hole, the East End Grill, which is just around the corner from us. The place was busier than usual due to the FedEx St. Jude Classic being played at the nearby TPC Southwind course. Most of the crowd was outside listening to the band playing on the patio, so we were able to find us some seats at the bar. While we are becoming regulars, we aren’t known well enough to have our seats reserved at the bar, like Miss Lynn, Steve, Tall Daryl , Big Daryl, or Steve just to name a few. We found a seat near Miss Lynn and the bartender, Carter, had a Coors Light ready for me as soon as I sat down. Tammy settled on a Bud Light Lime. I say she settled on a beer because what she was REALLY wanting was just a Sprite. She only wanted the Sprite because she had smuggled in some X-Rated Fusion Liqueur in a water bottle and was hoping to make her own drink. She decided against it due to how busy the bar was (and because Carter gave her the stink-eye when she mentioned it). She had a couple of beers before Carter’s girlfriend, Casey, arrived with Long Arms Lori. Once Casey found about Tammy’s water bottle, she told her to order a Sprite, take it to the bathroom and pour in her juice. Tammy ordered her own Carter Special and it wasn’t long before I saw her adding a little X-Rated into the concoction. A few minutes later I saw her adding a little more into her drink. She went down to ask the women who was also drinking a Carter Special if she wanted to add a little to her drink but quickly came back. Tammy: I asked her if she wanted to add some X to her drink, but she said she didn’t want any. Me: She prolly thought you were trying to give her drugs. Tammy: I think she did at first, but I told her it was the X-Rated drink. Tammy: She said she’d had it before but didn’t like it. 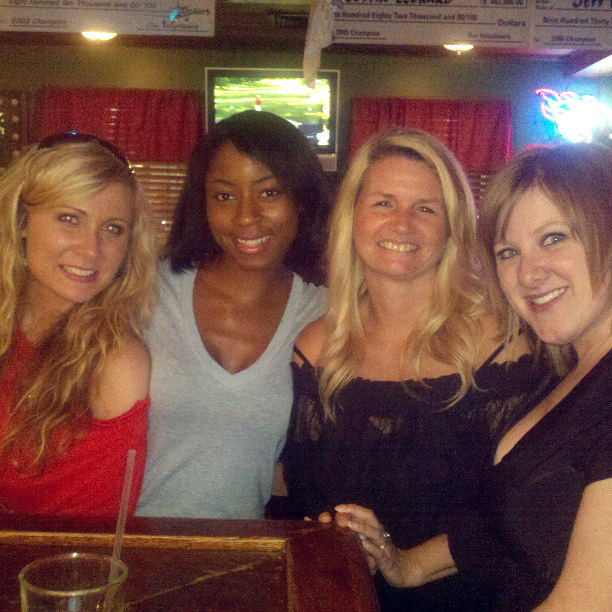 Determined to spread her X-Rated love around the bar, she offered up her bottle to Casey and Long Arms Lori. Casey took a couple of big swigs before handing it off to Lori, who looked like she was drinking pee water. It wasn’t long after this before things started going sour for Tammy. Long Arms Lori, Barbara, Tammy and Casey, not long before Tammy started getting X-Rated. A little while later Tammy was starting to feel the effects of the Tammy’s version of the Carter Special. Tammy: I’m drunk. I can tell because my eyesight is blurry. I can’t remember WHY she wanted to go back to talk with the couple down the bar, but I do know that I carried her down there. Literally. I picked up her bar stool, with her still sitting in it and put it behind the couple. The guy was talking to Tammy for a few seconds when he said something that set her off. Guy: You are beautiful as hell, but, don’t take this the wrong way, but that voice, it’s so high and shrill. Tammy took it the wrong way. The second he turned away Tammy launched into an obscenity-laced tirade that, while I remember it clearly, I won’t repeat here. One second after she finished I began dragging her chair back down to our original spot by Casey and Long Arms Lori. She continued her verbal onslaught on the guy to the girls, who couldn’t believe he said that to her. Not much later I paid our tab and helped Tammy off her stool and aimed her toward the door. I figured that once we got into the car everything would be fine, but I was wrong. She continued her assault on the guy, getting so upset that she was pounding on the dash. Even though I was laughing hysterically at her reaction, I was taken aback by how vicious some of her attacks were getting. Fortunately for me our drive was short and I thought us pulling up would distract her enough to lay off. She got out of the car still voicing her hatred of this man. It wasn’t until we got inside that things started to change. Tammy: I’m lost in my own apartment. When I heard her say that I was worried it would be a long night. The next thing I knew she was on the floor in the living room. I didn’t say anything and headed out to check my car and, sure enough, her phone was in the floorboard. I came back inside and helped her to the bedroom. While she was changing into her pajamas I got a garbage can to put by Tammy’s side of the bed, just in case. She was still complaining about his comment until she climbed into bed. Once she hit the pillows she went silent. The next morning she remembered a few things about the night, including the comments about her voice, but not much after that. I’m just hoping that the next time we go to East End that a certain guy isn’t there or things could get X-Rated all over again. Gallery | This entry was posted in Daily Life and tagged daily life, drinking, friends, humor, life, Postaweek2013, relationships, Tammy. Bookmark the permalink.